One thing the news media doesn’t shy away from is telling you about how your technology use is out of control. Your kids are getting too much screen time. We’re costing businesses billions wasting company time on YouTube and Facebook. 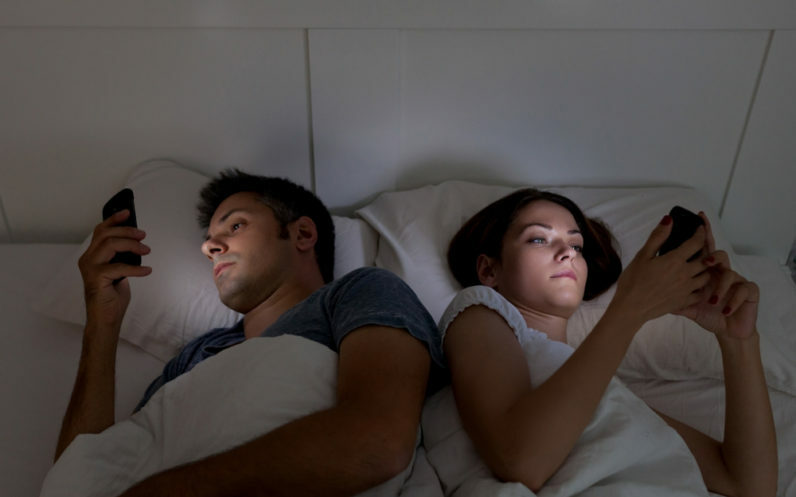 Experts say the reason your relationships are so screwed up is because you spend too much time checking emails and not enough time checking-in with people. So isn’t the answer to just calm-it-the-hell-down? Starting right now let’s all just stop looking at screens when we’re with family, at work, or on vacation. And, for extra measure, we’ll also just take more time to appreciate life and real face-to-face conversations. The only problem with that: unless you literally go off the grid and remove all digital connectivity from your life, it’ll always be waiting for you. If you aren’t addressing the “online” world in real-time it piles up. Email overload, experts say, causes a ton of stress. There’s no such thing as “going offline” anymore, unless you do it permanently. No matter how hard you try to just get away from it all: it’s all waiting when you return, like a neglected pet that’s going to require tons of extra attention in order to nurse back to health. If I don’t check my email for one day, my inbox becomes an abyss to rival the depths and horror of the Sarlacc. In 2017 I treat talking on the phone as something I have to do for work. The only person in my life who I call for anything other than business is my mother, and you can rest assured she’ll tell you I don’t do so often enough. Plus she’s in her 60s and doesn’t like to text. Anyone born before 1960 gets a free pass, if they want one. What happened to that? Did we fly too high, each of us an Icarus of the internet, and lose sight of reality? No, probably not. The fact that we’re stressed when we don’t connect doesn’t mean we’re doomed: perhaps we can just connect. We need to change the way we look at things. It’s becoming counter-intuitive and counter-productive to continuously suggest that the solution to our connectivity woes is simply to place arbitrary limits on usage. This doesn’t work for me – email and text messages are more than an upgrade to “the phone call” for me, they represent a ledger and record of everything going on in my world. I have “shared memory” with my devices. This means if I lose connectivity I know, at best, three actual phone numbers. One of them is 911. I can’t remember dates, I don’t keep track of my own appointments, and can barely use an ink-pen for anything other than stabbing someone trying to steal my tablet. We rely on the data we carry around in our inboxes and messages. I’ll be 100 percent honest here: I often start saying something that requires me to use Google search to finish. “Jason Mamoa? He’s one of my favorite actors,” I’ll say as I’m already pulling my phone out of my pocket “In fact, hold on, OKAY GOOGLE,” I pause until I feel the vibration, “how old is Jason Mamoa?” My phone responds and I continue speaking as though it was a part of the conversation “I like that he’s almost my age but still a badass.” I’ll conclude, as though I knew that all along. It’s not feasible for a lot of people to just put the phone away when they aren’t working – which is something that’s changed, it used to be. A lot of research has gone into telling people they need rules and boundaries with online usage. In light of that research, by real experts who are basically saying the opposite of what I’m saying, it might seem like bad advice for me to say: use your devices when you need to and check your email and messages whenever its appropriate. But consider that setting priorities instead of boundaries might actually be more beneficial, as TNW’s CEO Boris wrote, we sometimes treat what children are doing on their devices as unimportant without regard to what kind of online citizen they are being. Arbitrary time limits don’t respect their primary source of social interaction, and they don’t encourage prioritizing whether you should be staring at a screen or a person. We’ve also arrived at the era of adult professionals who grew up on social media. The President uses Twitter for official announcements. Don’t get me wrong, I’m in no way advocating you forget what experts say, nor do I claim to be any kind of expert here. What I’m saying is: there’s a difference between an addiction to being connected and the desire to stay up-to-date. I’m advocating the seamless integration of Siri into my life, not setting time aside for her. I believe it’s important that we stop trying to separate the “online world” from the “real world” and start prioritizing how we spend all of our time in order to avoid constantly being the source of our own anxiety. Hang on, give me a minute here and I’ll have a conclusion for you. Just a sec, checking this email real quick. Anyway, as I was saying, there’s nothing wrong with taking a few minutes to check your email and then returning your attention to the real world. Just don’t forget that the people who know you’re doing it are aware of where your priorities are in that moment.